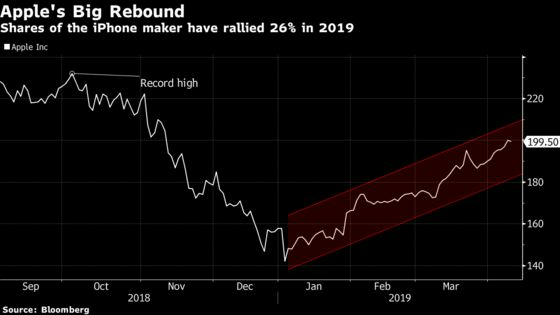 (Bloomberg) -- After an ugly 2018, Apple Inc. is back in vogue with investors who are looking past underwhelming iPhone sales and embracing the company’s vision of a digital services future. Apple’s 26 percent rally this year leads all but Facebook Inc. among the largest U.S. technology companies. The gains added more than $200 billion to the market value of the Cupertino, California-based company. The rebound will be put to the test when Apple reports fiscal second-quarter results on April 30. Analysts expect revenue to fall 6 percent, the worst year-over-year decline since 2016, according to the average estimate compiled by Bloomberg. Earnings per share is forecast to drop 13 percent. Amid falling iPhone sales Apple has emphasized newer digital services with higher growth rates and potentially fatter profit margins. Last month, the company unveiled four new offerings including a video-streaming service and a mobile gaming subscription. "Services is the long-term value generator of the business," said Kevin Walkush, a portfolio manager at Jensen Investment Management, whose fund added to its Apple stake in the fourth quarter. "Ultimately, Apple will become a services-first business and devices will be a way to help consume and support those services." Apple shares have also been buoyed this year by broader factors. The U.S. Federal Reserve stopped raising interest rates in late January, reviving investor appetite for technology stocks. There’s also been cautious optimism about an end to the tariff fracas between the U.S. and China. Those trends are bullish for other tech stocks, too, and Apple moved in tandem with the rest of the tech sector in early 2019. Then, on March 11 the company’s shares pulled away from the pack. That was the day Apple sent out an invitation to a glitzy event to unveil its new services. Read about Apple’s star-studded services event on March 25. "While concerns on iPhone unit trends persist, investors for now are choosing to focus on Apple’s services segment," Lynx Equity Strategies analysts K.C. Rajkumar and Jahanara Nissar said. Wall Street may also have been more willing to look past iPhone woes because of Apple’s relatively cheap valuation. In December, Apple’s price-to-future-earnings ratio slipped below 11 for the first time in at least a year, according to Bloomberg data. "When it sold off so much, it got down to a place where more value-based investors got interested," said Bill Stone, chief investment officer at Avalon Advisors LLC. "It opened up another investor base." Even after 2019’s rally, Apple is trading at about 17 times forward earnings estimates, compared with an average of about 20 times for the S&P 500 Information Technology Index, according to data compiled by Bloomberg. The company is also returning money to shareholders in the form of dividends and stock buybacks that exceeded $12 billion in the last fiscal quarter.